Windows uses special "XP Comment, XP Author, XP Keywords, XP Subject" fields (XP <name>) for presenting the associated information with the Windows File > Properties > Details presentation. After creating an Affinity Photo Exported JPEG file, the previous content of these fields disappear from presentation by Windows. Is there a way to preserve the use of these Windows "XP <name>" properties fields when a JPEG file is edited by Affinity Photo desktop and the image is Exported as a JPEG file (*.jpg)? 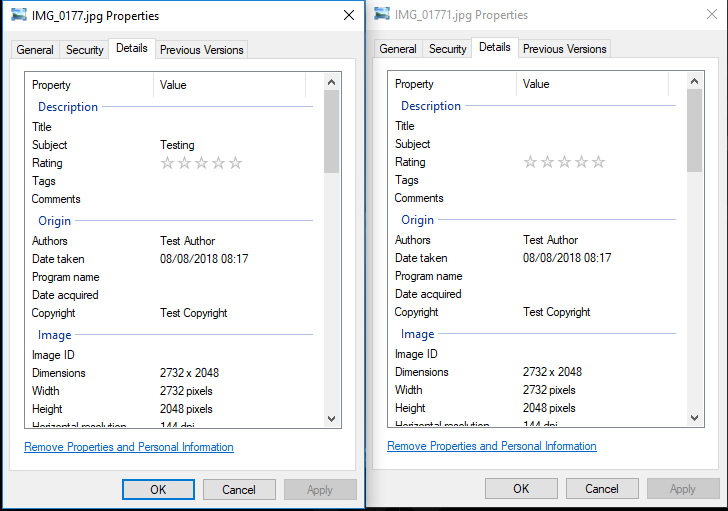 I've attached a screenshot below, the properties dialog on the left is before editing, and the right after. I can see that the subject field is not retained, but the Author, Date Taken and Copyright have all been retained here when checking embed metadata in the more... options of the export panel. Our developers are aware of this, and if possible we'll update Affinity in the future to withhold this info on export. With this post, I did not want any JPEG file properties to be withheld when checking embed metadata. I hope that you meant "hold or "preserve" this information. If JPEG file Properties - Details tab: Title, Subject, Rating, Tags, Comments, Authors, Date taken, Program name, Date acquired, and Copyright fields have content before an Affinity Photo edit, I would like the option to be able to retain this information after an editing session.